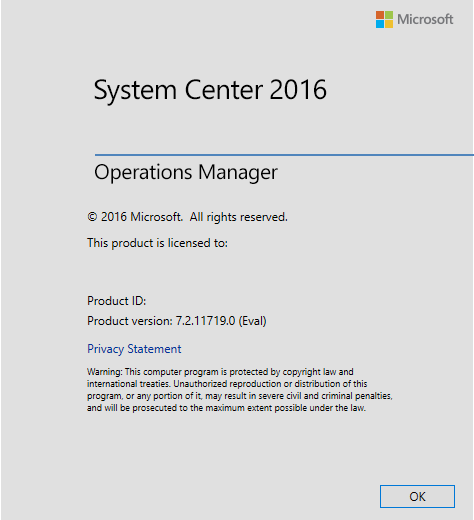 This post I will be installing System Center Operations Manager 2016 (SCOM) RTM, Build Number 7.2.11719.0. Here is some of the background information. 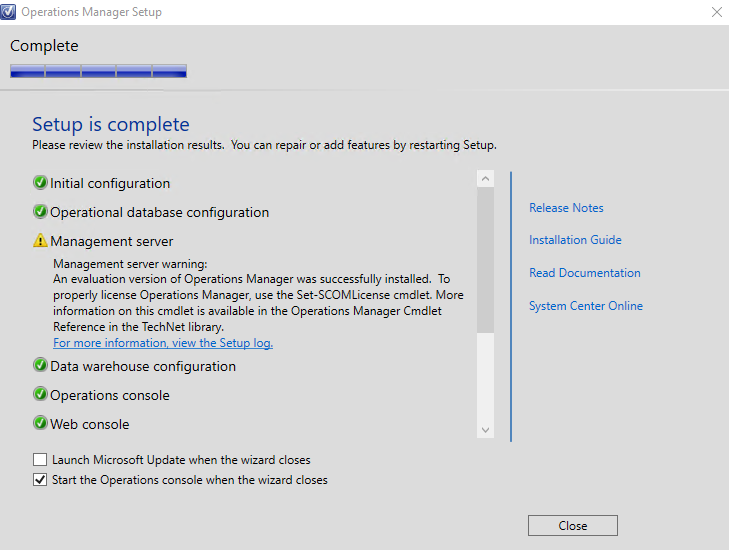 As this post will concentrate on the installation of SCOM 2016, I am going to omit the setup and configuration of the Domain Controller, Windows Server 2016 for both SCOM Management Server and SQL Server (Please note, I am using SQL Server 2016, both servers on Windows 2016). 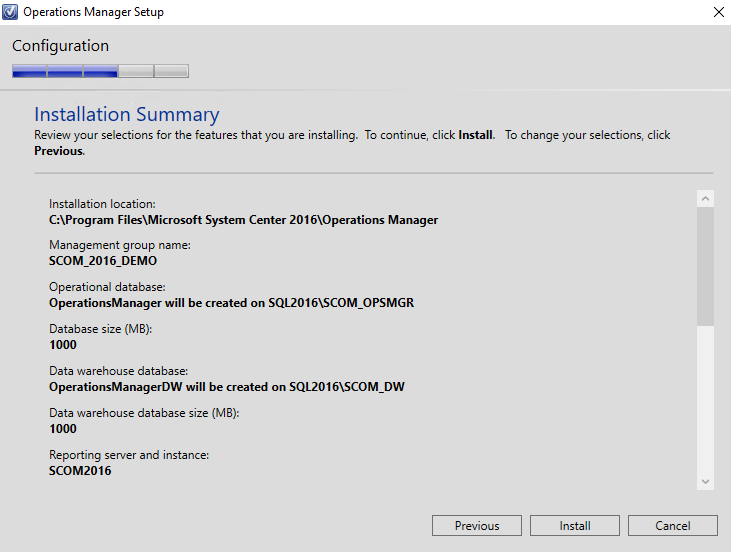 If you need help setting up SQL 2016 for SCOM 2016, please visit HERE. Now, if you’re lazy like me, or are tired of doing this setup for environments, I have scripted the automation of these accounts. You can find that link here, Microsoft TechNet Gallery. Well, that’s not new… Errors. Since this is a clean, vanilla Windows 2016 server, we will need to install all the necessary Web Console components, along with Report Viewer Controls (probably SQL CLR Types too..). For the Report Viewer Prerequisites, go HERE. Note, oddly I was unable to install with CLR SQL 2016, Reports Viewer still complained and required CLR SQL 2014. Once the server is back online, you will need to register ASP.Net. You will need to apply the following using Command Prompt (as Administrator)). Once the server is back online, let’s try that Prerequisites check again…. Great! Now all of Prerequisites have been met! SQL Server will be where your SCOM SQL instance(s) were installed. 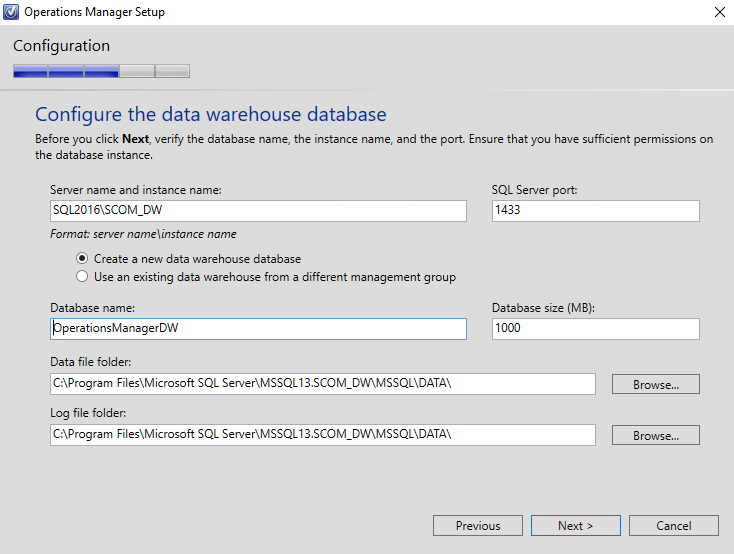 For me, I have built two instances on my SQL2016 server (SCOM_OPSMGR & SCOM_DW). I recommend always keeping this off, and manually updating your SCOM infrastructure. One quick review. Looks good. Hit Install, and get some fresh air! Sweet! All good. I hope this helps. If you have any questions or issues, please drop me a line. 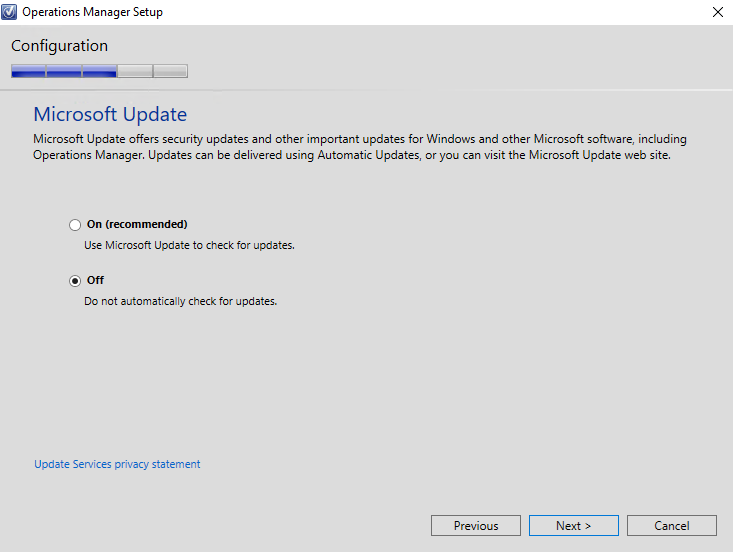 Please note, it is STRONGLY ADVISED to install the Update Rollup 1 once you have deployed SCOM 2016. For that walk-through, please visit the following post, HERE. 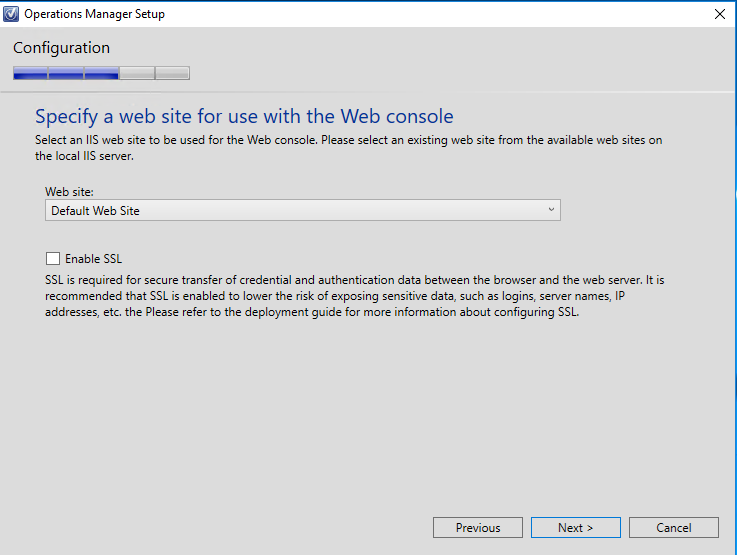 After running your PS cmd and registering IIS i still get the ASP.NET pre req check. Any suggestions? Did you follow the steps as mentioned above? 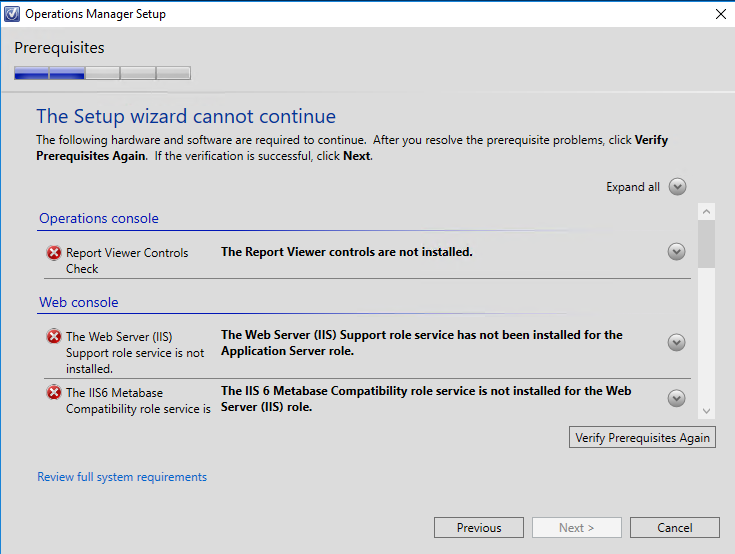 Yea turns out the check box on the ASP .NET 3.5 was still unchecked! Thanks for the guide! Really Helped! No worries! Glad I could help. 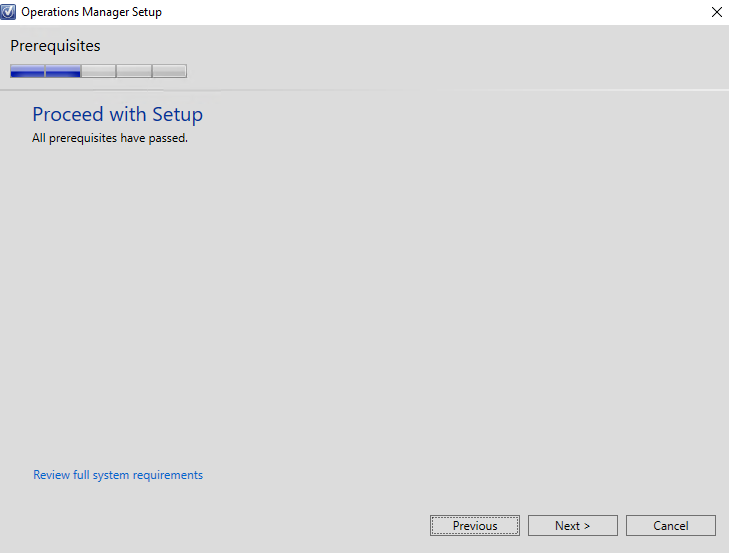 I will be soon building a SCOM 2016 environment and have read you need to have SQL installed prior to setting up SCOM. I am planning to use SQL 2016 and noticed above that you were going to add a guide with instructions for SQL 2016. Are you any closer to releasing this as it would be very useful to use as a guideline as the rest of your post is very good? Hi, I did not plan to publish that post for a few more weeks. But since you need that reference sooner than later, I will publish it later tonight. Thank you for the prompt reply Ravi. I have just seen your SQL 2016 guide attached. I appreciate you posting it sooner than anticipated. I’ll proceed with the build and let you know how it goes. 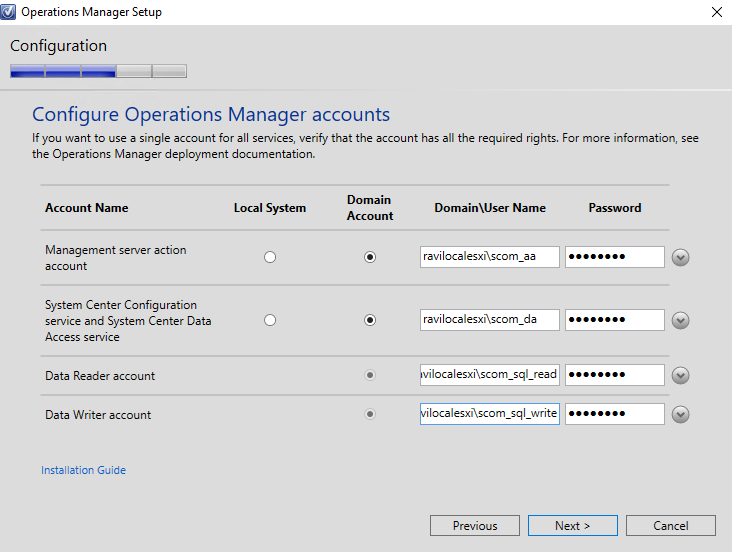 Powershell script create a account SCOM_OMS….why this account being created in script as it seems not used in the setup ? You can of course omit/comment out that account. Typically I am creating environments that will sooner or later leverage OMS. Thanks for the great guide. 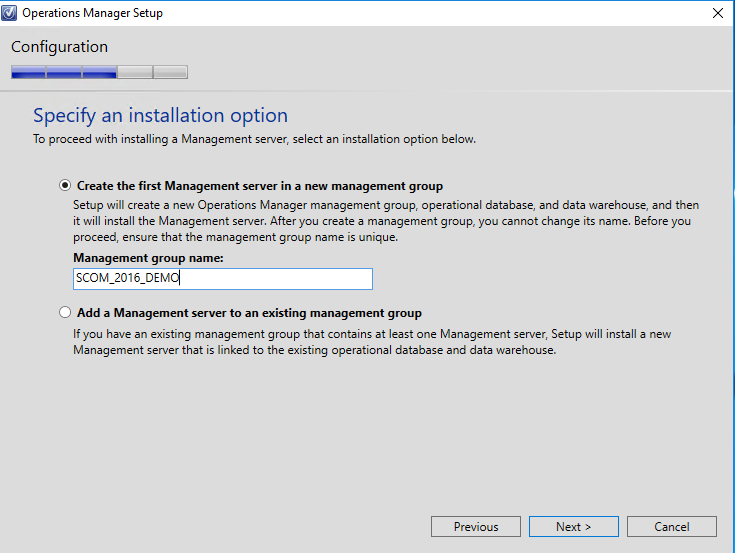 When running the setup the option to select Management sever is not selectable (grayed out). Any ideas? Is the management server feature already installed? Did the server pass the install prerequisites? Thanks for the quick response. The server had a 2012 SCOM agent installed. Once removed. It allowed me to select Management server. Ran into another issue. 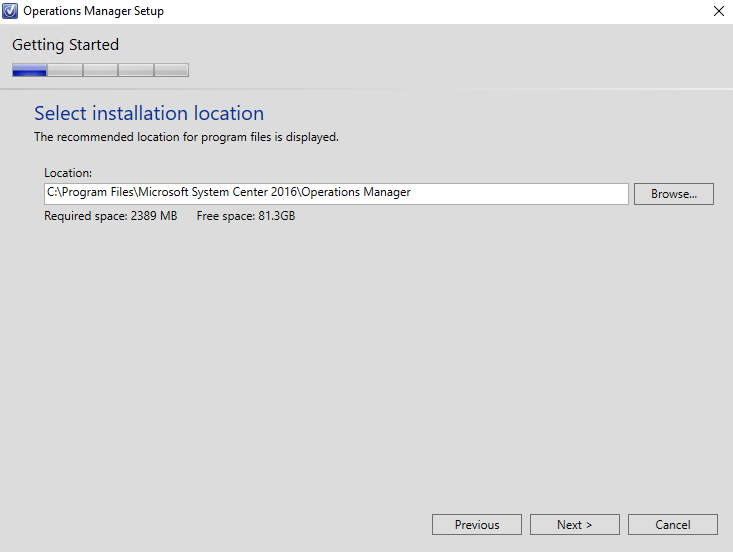 I installed a default SQL 2016 instance on my management server, however when running through the setup it does not show up as an option when prompted to select the SQL server instance for reporting services. The list is blank. Any ideas? Hi Tom, Was SSRS installed during the SQL instance install? 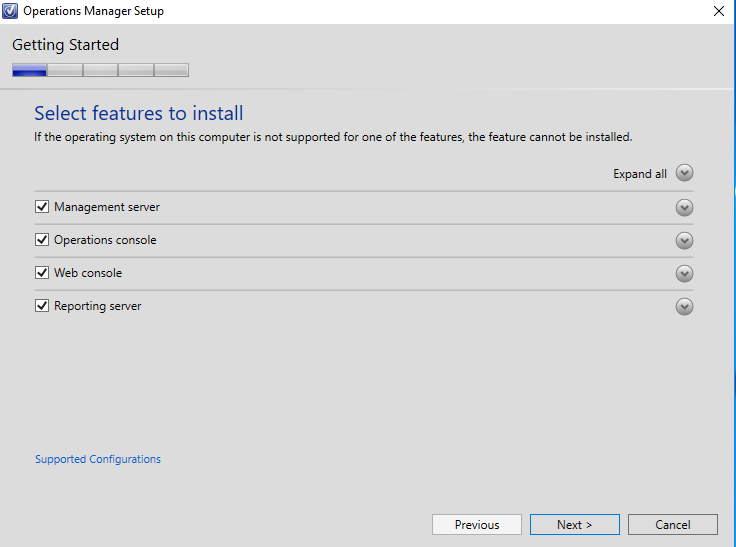 Did you select the option to install only, or install and configure? I would advise, go into SSRS and re-configure the setup. Then try running the SCOM install again. Hi Ravi, SSRS was not installed, after installing it, the server shows up as an option. Now there’s an error that it’s configured incorrectly. I’m in the Reporting services configuration manager. Do you know what needs to be done to get past the error? It really depends on the exact error. Can you please elaborate? The error is “The specified SQL Server instance is not valid. Hi Tom, there are several blog posts on SSRS and SCOM, have you taken a look at this, http://jimmoldenhauer.blogspot.ca/2012/11/sql-2008r2-configuring-ssrs-for-scom.html? Yes thanks, I finally got past the SSRS errors however SCOM still fails during the install phase. The install appears to be much more complicated than I expected. I think it may be due to the SQL server configuration. Is there a reason you’re using two instances? Typically in production environments, I suggest to my customers to have the SCOM OpsDB and DW (Data Warehouse) on separate instances and also on separate servers. This is due to the IPOS and workloads the DW commands. If you choose, you can always install both DBs on on server and a single instance. Using the SQL Server default instance resolved the issue. Just dropping in to say I followed this guide for SCOM. Thanks kind stranger for your wisdom. Hi. I didn’t see where in the SQL install that you installed reporting services. When should that be done, and to which instance, or both instances? The screenshot above where you select instance for SSRS to instance SCOM2016, I didn’t see that created in your documentation. Please advise. I want to install SCOM and SQL (both 2016). I want to use the same server for both in dev, and have separate servers for prod. Hi Mick, that is odd, the SQL 2016 install link may have been broken on the post. I have fixed that now. Nevertheless, the answer to your question. In most environments I would deploy a dedicated SQL instance for SCOM Reporting. 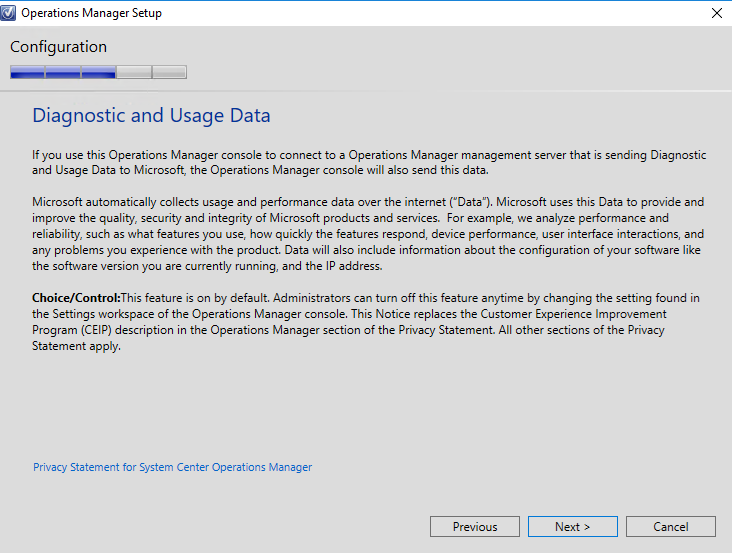 But you can always install SSRS along the OperationsManager database instance and/or OpsMgr Data Warehouse instance. Once you have made that decision and configured SSRS, you can select the Reporting features to be deployed on a specific instance then. I hope that helps. SQL server instance does not show me any instance to select. I added the native “feature” reporting. I have configured TCP port 1433 for all sql services. I have disabled the firewall at both the database server and scom. I have disabled the proxy server at both the database server and scom. I checked with telent the 1433 and 80 port. it seems good. Hello, was the SSRS configured after the SQL install? Verify the SSRS is healthy. 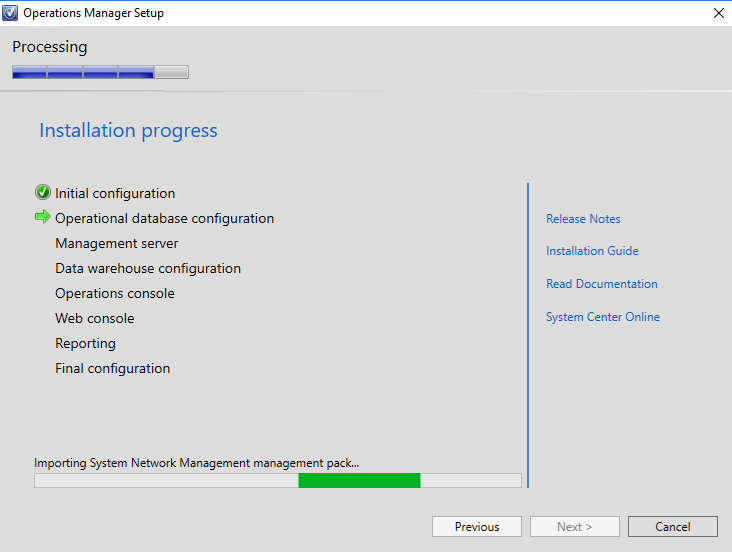 Using SSRS Configuration Manager, ensure you can connect locally. 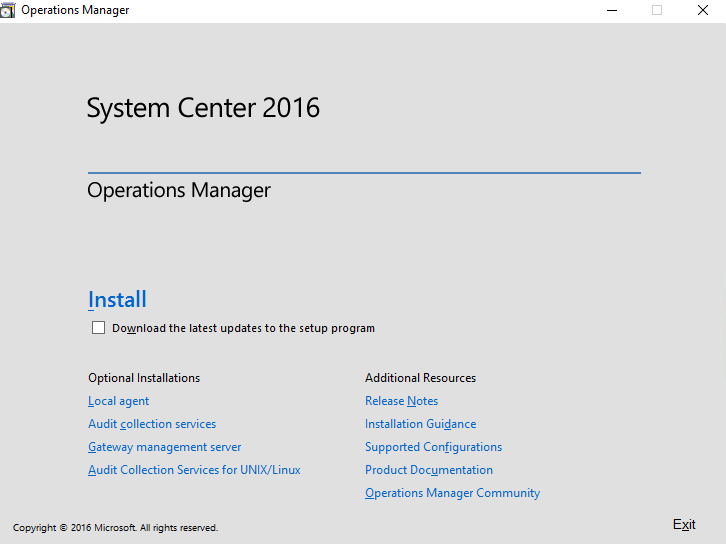 I’m new in System Center and I need to install/configure Operation Manager, Configuration Manager and Virtual Machine Manager. Is there a recommended installation order or can I handle it as 3 separate installations? Hi, I have found your guides very helpful. Thank you for providing them! I have a few issues with my current SCOM 2016 and SQL 2016 Configuration. – I can’t get Notifications to be sent despite creating a Channel, Subscriber, Subscription, and a Run As Configuration Account. I don’t have an on premise exchange server. My environment is all Office 365 cloud based and AD synced. 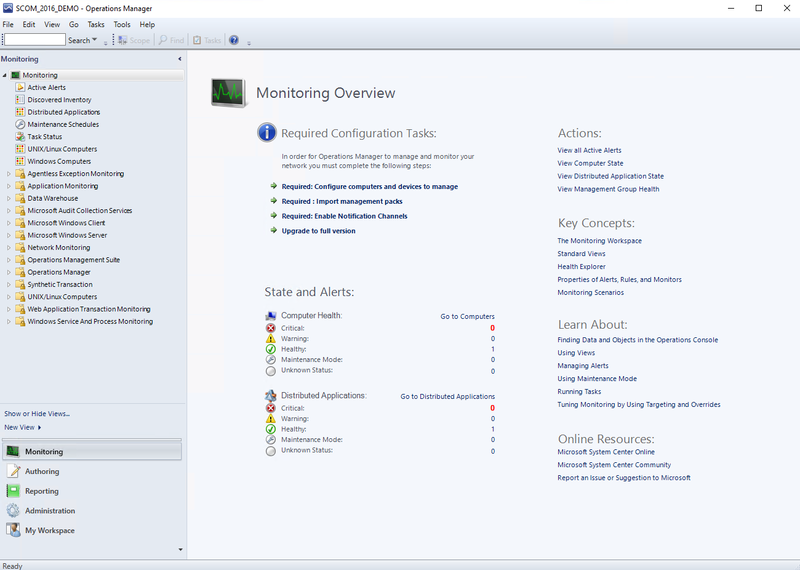 I believe theirs suppose to be a Monitoring Host service but I don’t see it at all in my SCOM management servers services. My reporting url does display a dash in it “-” or a space then a dash then the forward slash. As for issue #2, have you tested SSRS in another web browser? Chrome? FF? etc. Issue #1 – We do have a relay server already with a virtual server configured. I don’t know how to get SCOM notifications going with an smtp relay server already configured. I’ve tried but havn’t gotten it quite right. Have a look at these posts. They should be able to help you sort your issue. I was able to get notifications working and generating to email. Thanks for the information and assistance. Now I’m looking to exclude some servers from creating a notification by email. I want to do this with test servers where they generate a SCOM Alert but not a email notification. I’ve made several groups to test and modified the criteria in the subscription I already have been using but so far creating a custom group hasn’t worked. When I use create a group, then adjust the criteria in the Subscription to use that group no notification to email is created. When I take the group out of the subscription criteria then email notifications work. I am not too sure if I follow. What is the ask, are you trying to have a group where its alerts are only generated in the SCOM console, and no SMTP alerts are sent? Hi Ravi – Excellent notes. 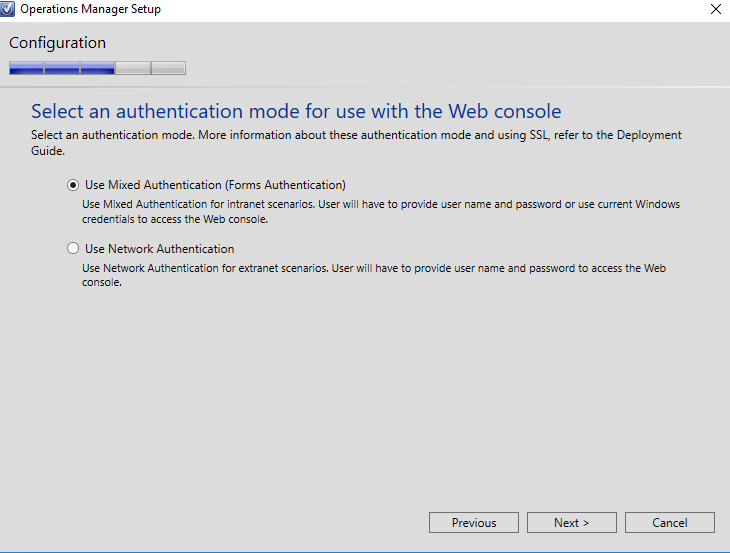 I followed and installed 2 instances (SCOM_OPSMGR and SCOM_DW). During the install, I selected Reporting Services Native (install and configure for both the instances). Logged into SSRS and I see both the instances and two reporting services database. My question is do, I configure SSRS for both the instances or just for one? Hello, you only need SSRS for one of the instances. 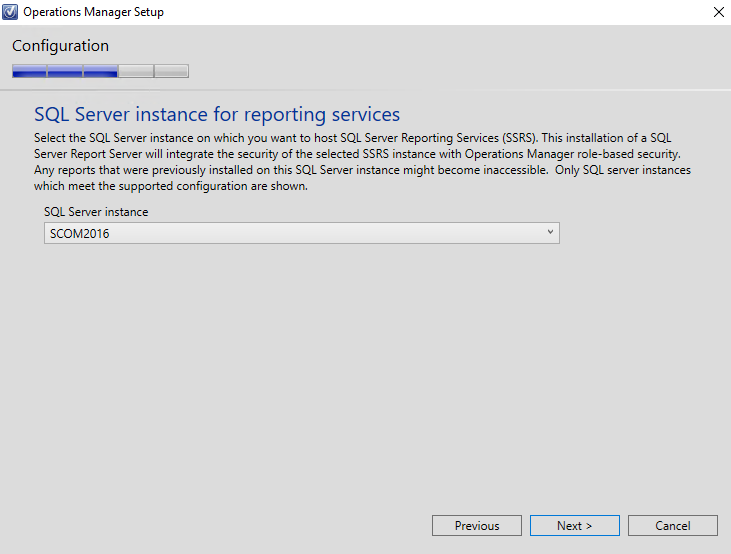 Reporting can be installed in either instance, I typically install on the OpsMgr, as the hit to SSRS is minimal. You can always install SSRS on the default instance, or create a dedicated instance for SSRS, but that is a bit much. Thanks – Followed the instruction and installed SSRS on OpsMgr instance. All worked out well. Have you installed ACS on this server as well? I did not install ACS in this scenario, however you could install it on any server. Can SSRS database share the same instance as OpsMgr in 2016 SQL Svr Standard with Availability Group configuration? And what is the best practice? Yes, you can run SSRS on the same instance has the Ops DB. Typically SSRS is not a high priority, so there is no best practice around that. However if you want to achieve HA for SSRS, then deploying a DAG or Always-On is best. 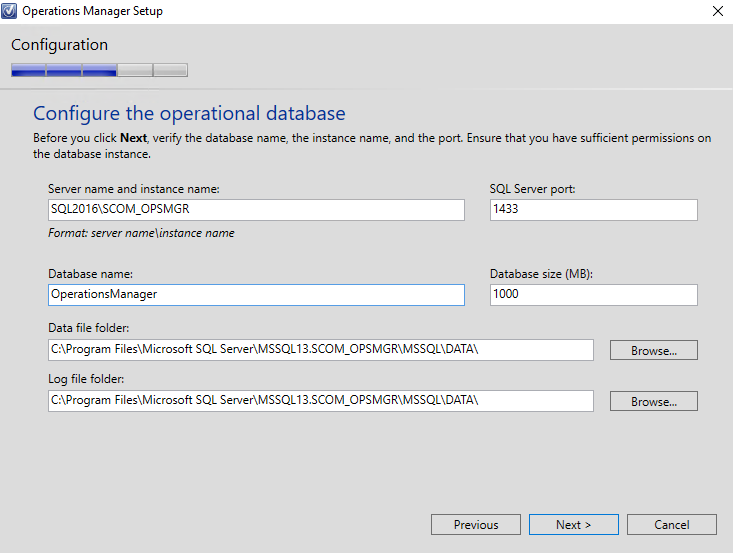 Question, is it advisable to separate the database from scom server? like have a sqlserver server and a scom server or install both in the same server? for production environments, and even dev labs, always separate the workloads. dedicated SCOM management server, and a dedicated SQL instance. if you can, have a dedicated SQL instance for Ops Mgr and DW. and ideally mirror dev with production. Thank you for all you do on this site! We are getting a brand new SCOM 2016 server installed to monitor only 50-60 server devices, a few SCCM & DP’s, exchange, Unix/Linux servers and the rest print servers, db, app servers located mainly at the home base with a few servers spread out over 6 states here in the Southern part of the US. My question is could we get away with only running 1 VM server with 8 cores & 16gb ram loaded with Server 2016 x64 DataCenter & SCOM 2016 RU5 and/or should I have another MS server for running ACS? Can we configure the SCOM DB and WDB running local on this same server considering it’s only for monitoring a few servers? Also is SQL Express to install ok or do we need to purchase a SQL license? How many servers all together should we dedicate for SCOM? I think you can get away with having just the 1 server supporting your SCOM management server that is also running ACS. 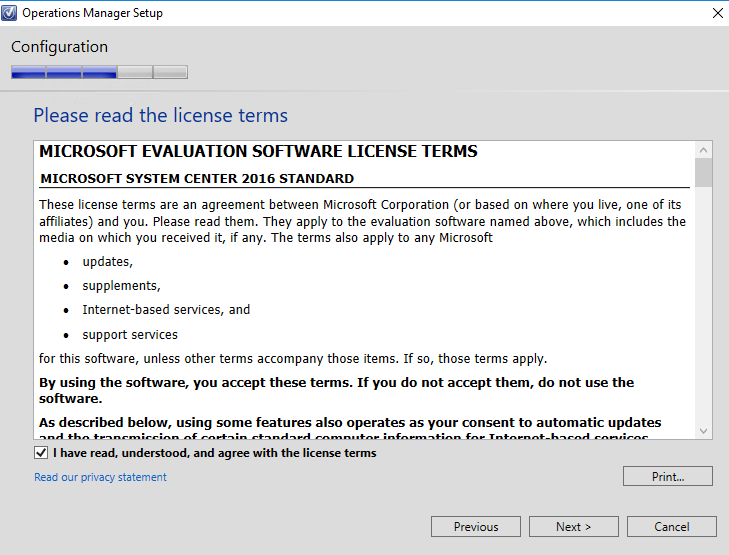 For more details see the system requirements from Microsoft here, https://docs.microsoft.com/en-us/system-center/scom/system-requirements?view=sc-om-2019. Depending on your resources, you can get away with having the Ops DB and DW on the same server. I would recommend having two different instances for the DBs. Since the number of servers is low, this should be fine. You could probably get away with having both databases on 1 single instances since the IOPS could be relatively low. Lastly, for running SQL Express, I don’t think this is a support option. I am pretty confident you need to go with at least Standard SQL. Enterprise if you plan to do Always-On. For more guidance around SQL/SCOM requirements, see here, https://docs.microsoft.com/en-us/system-center/scom/plan-sqlserver-design?view=sc-om-1711#sql-server-requirements.